'Tis the season to forage for truffles. But why are we suddenly mad about this expensive delicacy? Périgord, or the Dordogne as the area is now known, is famous for a variety of things such as its stunning landscape, its culture and of course the food. But one main attraction for food-lovers is the presence of the elusive black truffle. The black truffle is a dark tuber of the fungi family and is incredibly sought-after. Of the 200 species, this is one of the most valuable truffles and is sometimes named the 'Périgord Truffle' after the region it is native to. Truffles are pungent in aroma and high in price, so when they’re used in cooking, it is only sparingly for a kick of flavour. Truffle oil is becoming more and more popular now in restaurants and and you’re likely to come across it on various menus. Deceptively, the oil doesn’t actually have to contain a large content of truffle and, in fact, a lot of them are artificially produced. Oils labelled ‘black truffle oil’ may not contain any black Périgord truffle at all. To taste the real deal, get yourself to France and browse some of the famous markets; here you’ll find them, especially in the winter. 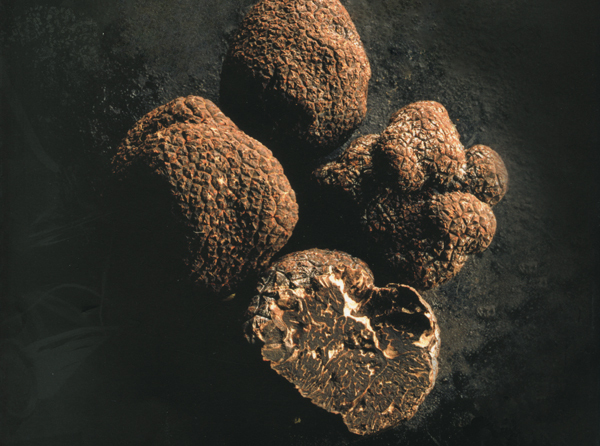 Growing amongst the roots of oak and hazel trees, the black Périgord truffle is usually found in late autumn and winter and will often be sold at the traditional produce markets that regularly fill the quaint Dordogne market towns. There are a couple of really famous ones; Sainte-Alvère hosts an important truffle market nearby. Trade begins at the beginning of December and carries on right through to February. It takes place in the covered market area on Mondays. Sarlat (in the above video) is also well-known as a gastronomic centre and, as well as its popular Christmas Market, it also holds a weekend truffle festival each year in January. This brings many people to the town for the famous food and the weekend often entails culinary events, workshops, demonstrations and tasters. This usually takes place on the third weekend of January. Because they are essentially fungi, truffles are found often at the base of trees, amongst the detritus of the forest and woodland floor. They especially favour hazel and oak tree roots. One popular walk from Constant, which you will be able to find at the reception, leads guests straight past the truffière of Claude Perrot. 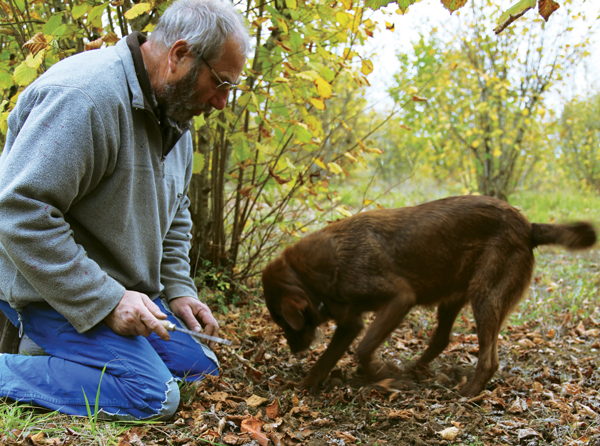 A truffière is an area of land that has been specially cultivated to produce them and Claude digs these Dordogne delicacies in the woodland with his truffle-hounds. Traditionally pigs were used for hunting truffles because they were especially good at sniffing them out, but now dogs are preferred: they're easier to train and they don't go around eating them all! For Claude, harvest time is between December and the beginning of March. The truffles have a very unique aroma and taste, so though some may start appearing as early as October, if you harvest them too early the smell is weak and the flavour is nowhere near as good. Claude's top tip is not to overdo anything when it comes to truffles: don't overcook them, and don't over use them. A little goes a long way! The truffle goes beautifully with egg; keep things simple and have that on toast, or maybe add a bit to baked potato and cheese, or sprinkle onto salmon. A dash of truffle certainly adds a little something special. Don’t pass up the opportunity to try the black truffle while you're in the Dordogne. Keep your eyes peeled next time you're walking the area around Constant, and visit one of the local markets. Find out how to stay at Constant yourself by popping your details in at the bottom of the page for a free brochure.